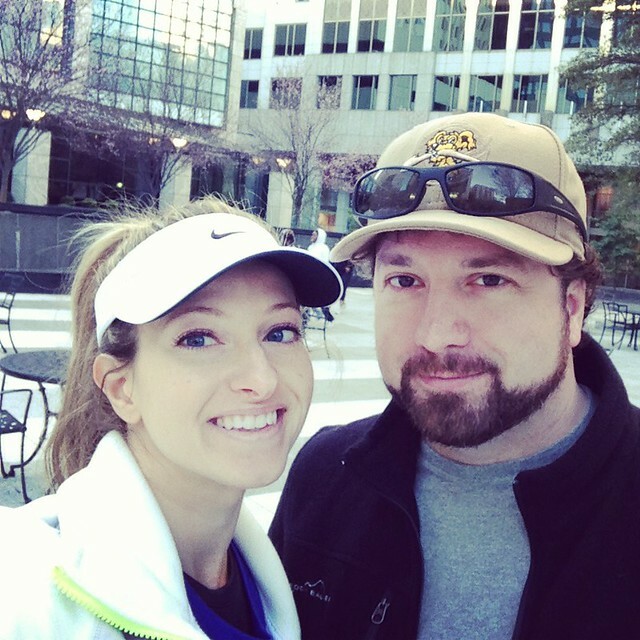 A few weekends ago, I ran the Alston & Bird Corporate Cup half marathon here in Charlotte. It was my third half marathon, and since I just PR'd in Charleston a little over a month ago, I wasn't really out for anything other than fun this time. My goal was to come in somewhere around 1:56 to 2:00, but nothing crazy. Mostly because I didn't really think my training in the six weeks between Charleston and this race was anything that would give me another PR so soon anyway. 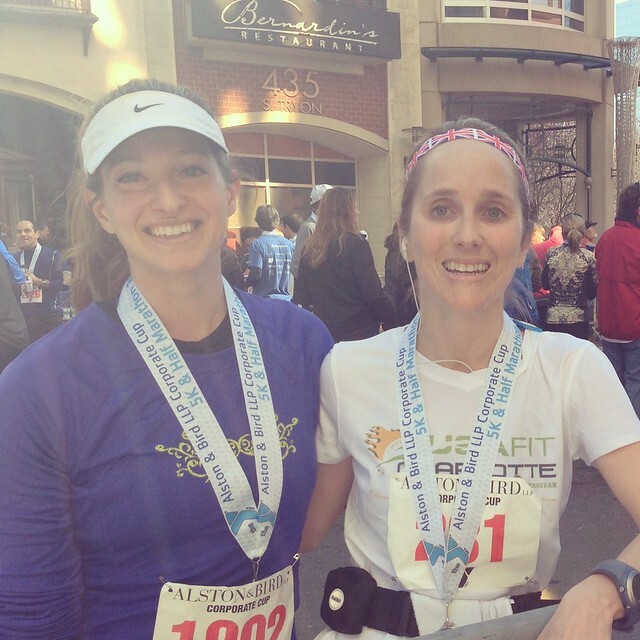 I also didn't know what to expect as far as the course and Charlotte's trademark hills, since my last (and first) half marathon in Charlotte was pretty hilly and I came in at 2:07. And even though I've come a long way since then, I still wasn't sure how I would race on the hills compared to the flat land in Charleston. It turned out that this course was similar to the first half of the Thunder Road Marathon course and (in my opinion) pretty flat as far as Charlotte goes. Admittedly, that could be because I purposely seek out the hills for training and my body has adapted, because I heard other people commenting that the course was very hilly. There were a few sharper inclines and some rolling hills, but overall, this was a really fun course for me and a much faster one than Ramblin' Rose (that first half marathon). Again, that could just be because I'm more advanced in my training now than I was then, but I really don't remember a break from hills during Ramblin' Rose and there were several nice, flat stretches in the Corporate Cup. I prepped for this race pretty much identically to the Charleston half since I had such good results from that. The night before, I ate some pasta (sans fish this time around), and woke up on race day to a breakfast of whole wheat bread with a little bit of chocolate hazelnut Pocket Fuel, a banana, and coffee. And I added a hard boiled egg. 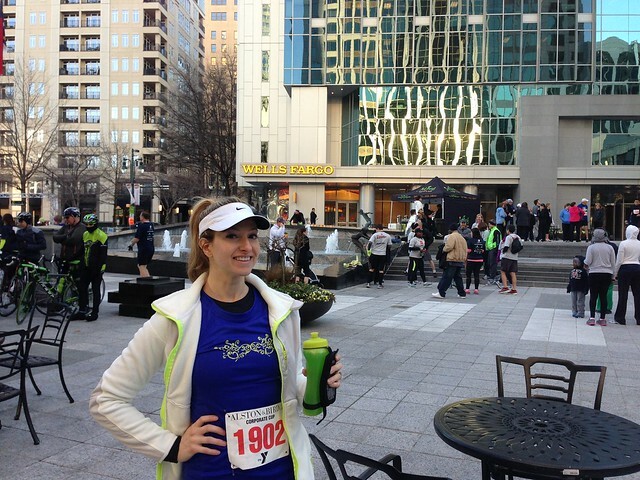 Then off I went to the race in Uptown Charlotte. While waiting near the starting area, I ran into Becky, a friend (and half marathon coach/pacer) from my running group. She wasn't coaching or pacing this race and had a PR goal in mind. I knew (if she let me) I could help pace her to get her there since her PR was close to what I had been planning to run. So, I told her I'd stick with her if she wanted me to. And she was happy to have me - although, she may not have felt that way somewhere in mile 8 where I was shouting about some silly hill not stopping her from PR'ing. We stuck together the entire race and Becky got her PR! So many people view running as an individual sport, but don't be fooled: there is power and camaraderie in numbers, and you can draw strength from another person when you're running. Truly. There were moments late in the race where Becky and I were linked arm-in-arm, running up a hill together. To me, her not getting her PR was just not an option (and I'm pretty sure at that late point in the race, she was feeling the same way). So even though I didn't hit a personal record at this race, running with a friend and watching her PR was so fun and rewarding - I was almost as happy as if I had reached my own PR. During this race, I learned I love pacing (and coaching), and according to Becky, I'm apparently pretty good at it. I'd love to start pacing half marathons in the near(ish) future. It's a nice way to run more races without pushing myself really hard every time, plus I still get a medal for my collection and the race experience. As for my overall performance, I felt infinitely better during this race than I did during Ramblin' Rose and coming in at 2:01 wasn't nearly as difficult as that 2:07 from before. Which got me wondering...if I go all out and race a half here in Charlotte, what would my time be now? And so, when I said it was my last half marathon until fall, that may not have been exactly true. After the Corporate Cup, I decided to give it one last hurrah before the summer of 500 5ks. I signed up for Charlotte Racefest, which is in two weeks and this really will be my last half until fall, largely because there are no more in the Carolinas until September. I'm not necessarily out for a PR (this course is definitely more hilly than the Corporate Cup course), but I am out to gauge my fitness since Ramblin' Rose. I've put a lot of training in since then and I'm excited to see the results!